It was only in 2011 that the Spanish manufacturer, Irizar, showed its first fully integral DAF powered coach products at the NEC show. The subsequent formation of the new Irizar UK dealership to market them in the UK has been highly successful, consistently exceeding sales targets for the product from day one. The two key figures from the outset were Steve O’Neill, former MD of The Kings Ferry, and Ian Hall, latterly Sales Director with BASE Coach Sales but with considerable experience in selling the Irizar product on Scania chassis. 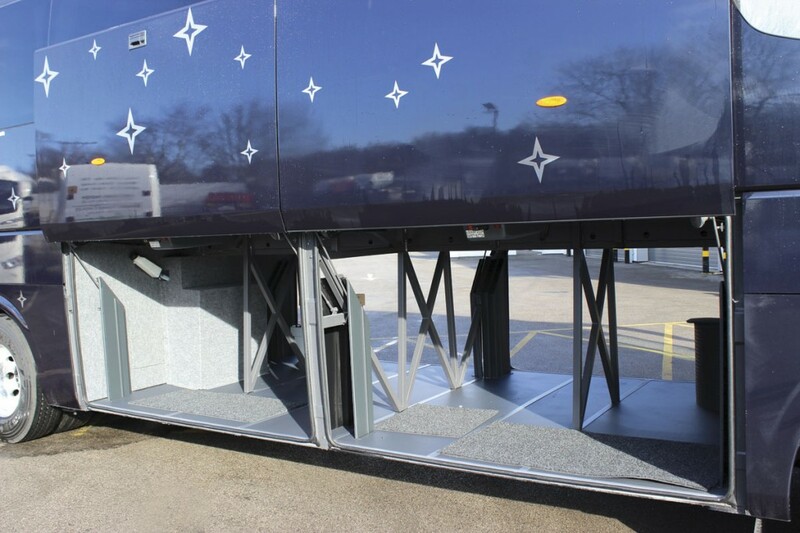 Both are shareholders in the company and have worked together with their team to successfully establish the integral range in the UK, indeed the UK is the biggest market there is for Irizar’s integral products. I met up with them meet the team, hear about progress, look at some new developments and sample the delights of Dinnington recently. To date, the UK has been the market that has been swiftest to embrace the integral range but its popularity is starting to take off more widely, and as a result production at the Ormaiztegui plant has just been doubled to one vehicle a day rather than one every two days. From the beginning, demand for the i6, which has been the product this market has really identified with, has been greater than predictions within the detailed business plans the company has produced. In the 2014 calendar year, the target was to invoice 37 coaches but in the event the number was over 30% higher at 49 units. Of sales, over 80% were two axle i6 models with the remainder a mix of the lower height i4 and tri-axle options. A good start to 2015 has been made. This year’s business plan target is 60 coaches and orders have already been taken for 50. Bolstering this are two significant orders. One is a 13 coach deal with Ellisons of St Helens, which has opted to switch to Irizar integrals rather than Neoplan. The first two coaches were delivered in 2014 with the total order including one 10.8m i6 (which appeared at Euro Bus Expo last year), four 12.2m super high i6s and eight 14m tri-axle i6s with MX13 engines rated at 513hp. 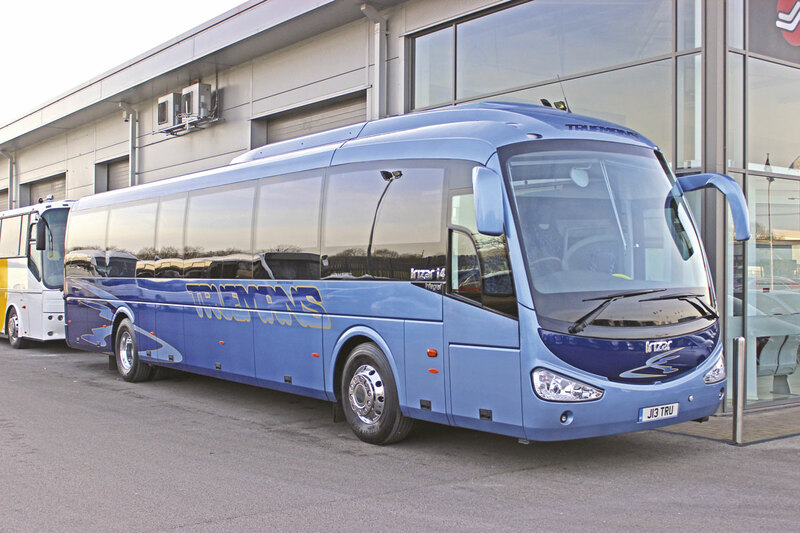 The second significant deal is from Swans of Chadderton who have come back to Irizar after buying five i6s last year. The new agreement is for two tri-axle i6s, two two-axle coaches with 55 seats and a toilet and six with 55 PB seats. All of the Swans vehicles will be Euro5 while all of the Ellisons will be Euro6. A further useful order, and another repeat deal, has come from The Kings Ferry, which took a 14m VIP specification i6 last year. After good experience with it the main yellow painted fleet is to get three 12.2m long i6s with side-mounted PLS semi-automatic 300kg passenger lifts. 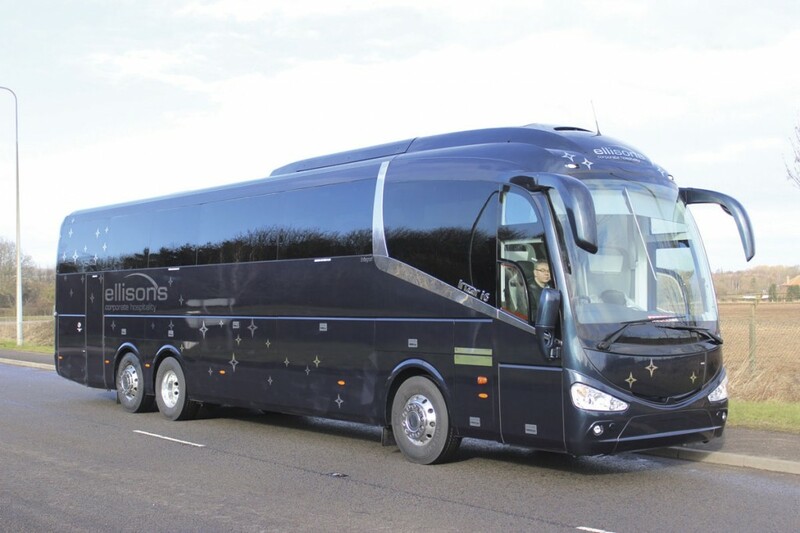 Stewarts of Mortimer, which was the first company to buy an i6 integral in 2011, is another repeat customer with three coaches on order taking their integral purchases over the 20 mark. 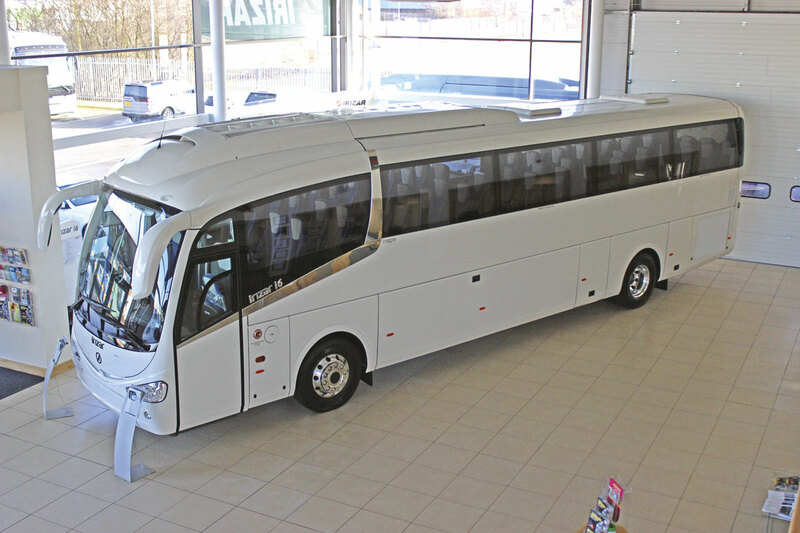 With the exception of these deals, all other sales have been for either one or two coaches, to a mixture of customers, many of them previous Irizar customers but others who are new to the brand. Examples of the latter are Barnes of Swindon, Chandlers of Westbury, Dartline, Catteralls, AC Williams, Weardale and Whites Minicoaches of St Albans. Similarly, Business Development Manager, Julie Hartley, who joined in May 2014, is used to looking after customers, as is long standing (by Irizar UK standards) Customer Support Manager, Rob McDonald. Another new appointment in the last year was Bill Moore who helps with financial planning four days a month. There isn’t a huge amount of invoicing but day to day financial matters come within the remit of Sales Administration Manager, Julie Hickin. 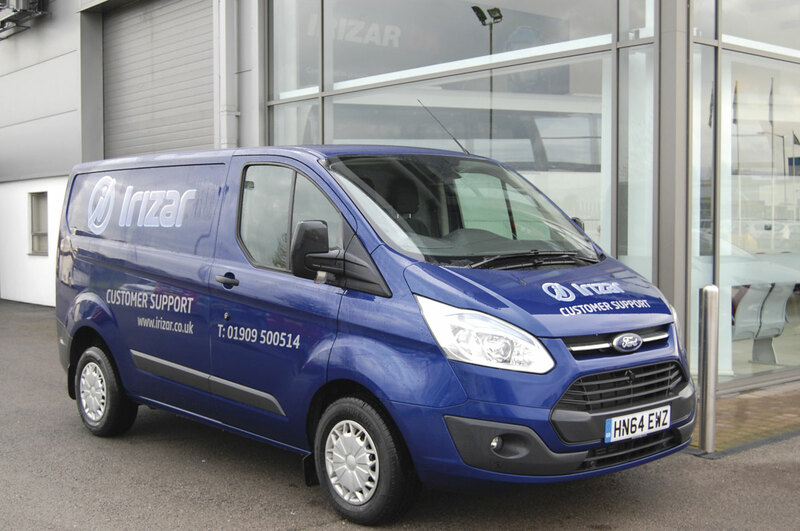 Helping to support customers in the field is Irizar UK’s ‘man in a van’, Darren Bradshaw who has joined from Volvo Frontline and is based in Wigan. He covers the north and recruitment is already underway to find someone with similar skills to cover the south. 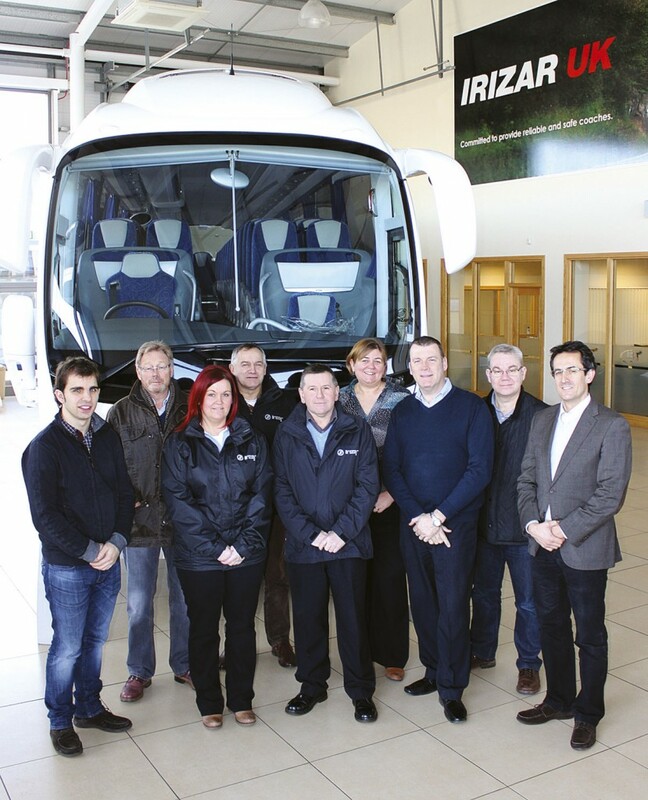 Irizar UK’s chosen support medium is quite different to some of the bigger players. They use the combination of the DAF network for most power train aspects with concerns such as Johnson Brothers, AD Systems, Airconco, Hunter Electrical and Air Door Services, supplying their specialist skills. This is backed up by Darren in his van with more appointments in this area anticipated. It was made clear that the current size was not the limit of the organisation’s ambition. Steve commented, ‘If we are to go through to 150-200 units a year we are going to have to mature.’ He added, ‘In the business plan for 2015 is an expansion of staffing,’ though he also made it clear that he did not envisage a time when he and Ian did not go out and sell coaches themselves. The product upon which the success to date has been built is the i6 integral. It is as a well specified coach that combines style, capacity and a competitive price that the i6 has found most customers and understandably Irizar UK have emphasised this model to good effect. With the 53 plus toilet (12.2m) and 57 plus toilet (12.9m) packages recognised in the market, attention has gradually broadened to establish which other niches can profitably be filled. Among the more obvious potential niches was the 10.8m long full sized coach sector, which did not have a vast amount of options on offer. The first 10.78m examples were unveiled at last year’s show for Buzzlines, which is taking a pair, and Ellisons. Two more have since been sold and will be delivered to Weardale and White Minicoaches of St Albans. The driveline configuration features the same DAF/Paccar MX11 engine and the choice of either ZF Ecolife fully automatic or AF AS-Tronic automated manual transmission. 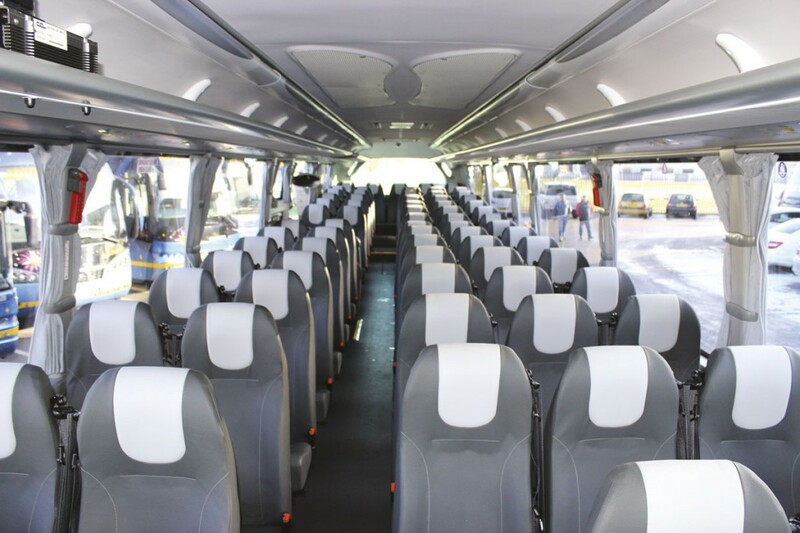 Capacity options are either 43 seats and a rear saloon toilet or 45 seats with no toilet. In both cases there is a rear offside continental door. Prices start at £220,000. The 14m option (actually 13.87m) has been available from the outset and has won favour from a variety of customers including Stewarts, Woods, Centurion, Buzzlines, Galleon, Eastons and Ellisons in 2014 with orders placed by Catteralls and Peter Godward (another repeat order) for 2015. Capacity is up to 61 recliners and a toilet. Soon to join it is a new 13.2m long tri-axle which can be supplied as a 57 seater with toilet although most customers are opting for 53 recliners and a toilet. Early customers include Stewarts (3), Lucketts (2) and Johnson Bros of Hodthorpe. Built to an overall height of 3.7m (3.934m over air conditioning pod) it is possible that a nominally 3.5m model (3.734m over air conditioning) will be introduced at a later date. All will have MX11 Euro6 engines. Steve mentioned that the availability of the ZF Ecolife automatic transmission with the MX11-271 (369hp) and MX11-291 (396hp) was relatively unusual with a tri-axle coach. Incidentally, it is possible to buy a super high version of the i6 on two axles, but currently only at 12.2m long with up to 50 seats and a toilet. 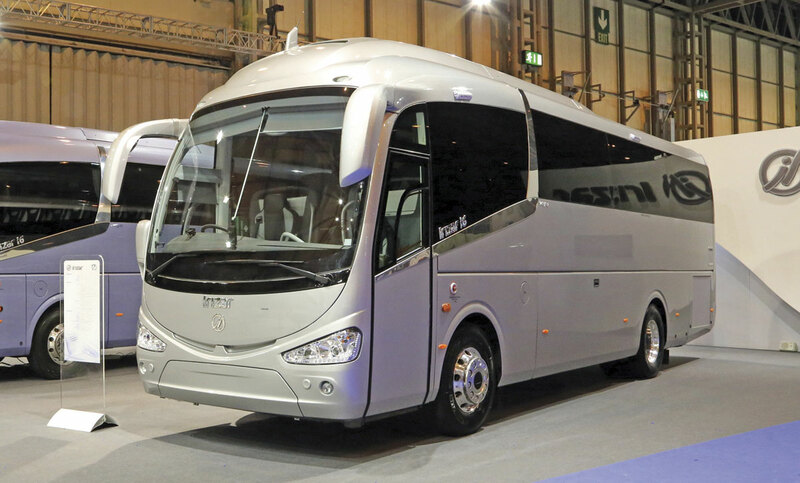 Hitherto, although there have been a couple of i4 demonstrators exhibited, the overwhelming emphasis of the Irizar UK sales focus has been on the i6 range. Without reducing efforts to promote the higher floor model, there is now an increasing realisation that there is also demand for a lower height alternative that the i4 can satisfy. Two examples of this trend were present at Worksop during my visit. 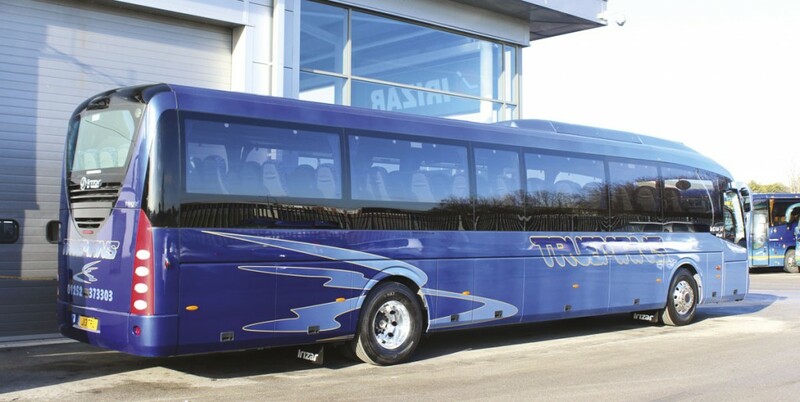 The first was a 70-seat, 12.9m long i4 ordered by Clarkes of London. This featured Prime Buckingham seats in a 2+3 layout trimmed in black and grey i-leather. Another i4 in evidence was one of a trio destined for Truemans Travel along with an i6 that together will join three i6s bought last year. Equipped with 57 i6 seats to enable them to undertake day trips, the i4s replace a trio of 57-seat Plaxton Panther bodied MAN R33s. The Truemans i4s have been specified with Euro5 DAF/Paccar PR265 360hp engines and AS-Tronic semi automatic transmissions. 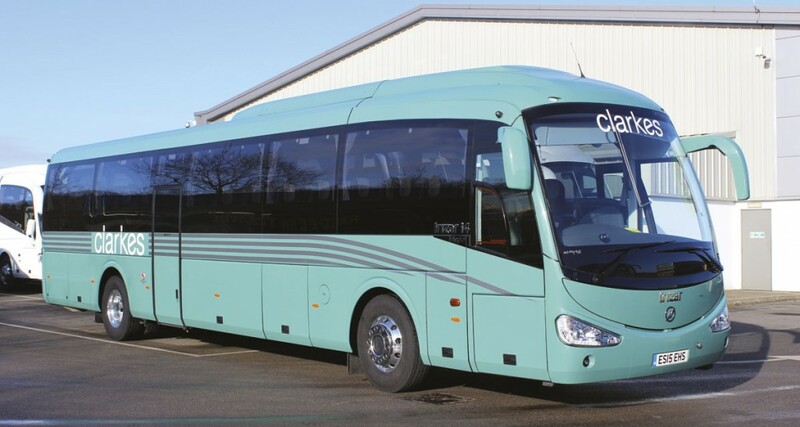 In contrast, the Clarkes 70-seater is the first Euro6 i4 integral for the UK and is equipped with a DAF Paccar MX11 unit. I thought the paint schemes on the two i4 coaches, though very different in style and colour, both showed how attractive the design can look with its external glazing which is deeper than the window aperture. To date, Irizar has been using existing type approvals developed for Europe for the i4 models offered in the UK, but it is now going through a development programme that will enable more UK optimised options to be sold. One of the developments is likely to be a parachute style emergency door that will permit additional seating capacities than at present. i4 prices start at £210,000 for a 12.2m example. There is no toilet option available. Many Irizar customers have been keen to continue specifying Euro5 engines, and at the time of going to press there were only five Euro6 powered Irizar integrals delivered and operating in the UK. However, there are very few more Euro5s to come because all production has now switched over to Euro6 for future orders. There are only the vehicles in the Swans order for ten as well as five stock 12.9m i6s still to be delivered with Euro5 units, and the team are confident that the remaining unsold examples will be sold within the month. Incidentally, the five left are all 57 seaters with DAF/Paccar PR265 engines and either ZF Ecolife or ZF AS-Tronic gearboxes. Prices for the semi automatics are £235,000 with the autos offered at £239,000. Euro6 specification coaches to the same 57-seat specification as the last remaining Euro5s will cost £240,000 for the AS-Tronic and £244,000 for the Ecolife automatic. Replacing the Euro5 options are two DAF/Paccar options; the 10.8-litre MX11 and the 12.9-litre MX13 which between them offer a range of outputs. Both are six-cylinder in-line units. The MX11 is offered with five different outputs. The lowest is the MX-11-210 which produces 286hp/210kW and torque of 1,200Nm with the other four delivering: 326hp/240kW and 1,400Nm; 369hp/271kW and 1,600Nm; 396hp/291kW and 1,900Nm; and finally 435hp/320kW and 2,100Nm. The MX13 is offered in three variants delivering 412hp/303kW and 2,000Nm: 460hp/340kW and 2,300Nm; and 510hp/375kW and 2,500Nm. Different outputs can be specified in various models but those with torque of over 2,000Nm cannot be specified with the fully automatic transmission. Steve reported that the early indications were that reliability of the new engines was ‘great’ and fuel consumption ‘significantly improved’, though obviously fuel usage would depend on the kind of work being carried out. A lot of new coach sales operations have come to grief over the years because they have failed to stay on top of the used coach side of the business. Selling new coaches inevitably involves taking in and moving on used ones which eat cash in stocking loans and can easily lose all the profit made on the new vehicle if they are overvalued to begin with or they sit around too long and the value originally thought to be in them evaporates. It is always a balance between how much the operator is prepared to take for a part exchange and how much an dealer can afford to pay; the temptation is to overpay in order to secure a growing number of deals and clog your yard and cash flow, so the art of new coach sales lies in getting this equation right. To date, Irizar UK have got the balance more or less correct. There have been a few mistakes, every dealer will make them, but overall things have gone well. This is partly because a proper plan for handling used has been in place and partly because the desire to continue growing sales has not induced recklessness in pricing. The appointment of the experienced and customer focused Derek Brumpton 15 months ago to handle used sales has ensured that the used stock is always getting attention, both in terms of upkeep and promotion. ‘He’s doing a cracking job,’ said Ian Hall. Around 40 vehicles were sold last year and only seven were carried over into the new year. Obviously additional vehicles will be taken in as new deliveries build up in the run up to the season but often Derek has placed them in advance of their arrival. Steve made it clear that the company is quite happy to take late swappers. ‘We will take vehicles from two years old to 20 years old,’ he said. At present demand for late coaches is particularly healthy. Over the past few years Irizar, which celebrated 125 years in business in 2014, has moved beyond offering coaches to add several bus models to its range. At present, the i3 low entry bus is essentially a body on chassis product that Irizar will only be offering through Scania in the UK. However, Irizar UK is involved in a project to bring the fully electric i2e low floor bus to the market in right hand drive. Unveiled in San Sebastian last year, the i2e has a bolted aluminium structure and a single Siemens DB2016 synchronic electric motor that has been specially developed for Irizar to give 15% more power and torque. Power is 180kW (230kW maximum) and nominal torque is 1,400Nm (peaking at around 3,100Nm). It drives a conventional drive axle. The batteries are Sodium-Nickel units with a total capacity of 376kWh and a nominal voltage of 600V/650V. Supercapacitors are also fitted. It employs a cable charging system which currently runs at 125 Amps and takes five hours though it may be possible to reduce this. Prototypes are already running in San Sebastian, Barcelona and Marseilles. And as for the delights of Dinnington; I’d never stayed at the Red Lion before but trust me to pick the night that half of their electric supply failed leaving their kitchen unable to prepare hot food. This we overcame with a visit to Paulo’s Italian/Mexican restaurant, but in the morning, as the snow flakes gently fell outside, I had a cruel shock when I turned on the shower and found there was no hot water. My equilibrium was further challenged when, while washing my hair in the icy flow, the lights went out because they had chosen that minute to reset the electrical system. The challenges that the Irizar UK team have faced have been rather different, not least on the wellbeing front, with both Steve and Ian overcoming serious health issues (a year ago Ian technically died before being resuscitated). Despite this they have achieved a most successful launch, in the face of predictions to the contrary, and they are now not only consolidating the position attained but looking at how the business can be taken forward from here. With new options, growing sales and a team developing to match the increasing vehicle parc, the light won’t be going out at Irizar UK any time soon. As I found during the evening, this is a team that is definitely up for it.